Seats are filling up fast – block your seat now. Register here! Totally agree, I am pleading a lot to be more present in Europe (since I live in Belgium). For a weird reason most of my followers on my blog, on Twitter and even LinkedIn are not from Europe. Are there plans for advanced courses/certifications for Captivate? My only reservation in signing up for the Specialist level is that, as others have observed, the concern about spending that much time and money only to be in a course covering the most basic concepts. I’ve attended the Adobe Learning Summits for several years and each time there is a Captivate session it seems very basic – which is fine for those just getting started, but frustrating if you have some experience. Thanks! I have been presenting ‘rather’ advanced sessions at the Summits, not advanced enough? As I wrote before: it is difficult to have ‘advanced’ courses, don’t believe a canned training nor programme can be suitable for any developer. That is probably already the case for this basic certificate. I’ve actually attended one of your sessions (in Vegas last year) and found it very educational. Thank you! Thanks for remembering me. Hope really to be able to present again and/or to be able to offer some webinars. $300 discount for Vegas in October! Is this certification similar to the Adobe Certified Expert exam? Is the work two weeks prior to the single day all self-study, or is an instructor available online? Adobe killed the ACE program for Captivate with version 8 I take it Adobe was just to lazy and there wasn’t enough money in it so they went to this Certificate. More than just the ACE for Captivate were killed. BTW I took that ertification once, long time ago and found it totally useless. Both the terms ‘specialist’ and ‘expert’ are simply misleading but that is my personal opinion. You don’t become an expert by learning some (outdated) Help documentation by heart, a one-day demonstration , not a real flipped class (which would be possible since there are learning assets to prepare) is to me just getting an overview of the features of Captivare, can be great for newbies. Wondering if the certification class is only held in Washington? Are there any online certification courses? Is there another date for the certification other than March 12th,2019? From the previous comments, I can see that there’s a lot of interest in an online certification program. I’m all for it ! I hope this idea hasn’t been abandoned. Besides, Captivate is for e-learning, isn’t it ? And as for certification value, if there is a set of skills defined and the test checking them included, it’s perfectly possible. Microsoft has certificates for a few knowledge paths, Cisco as well and it works. Certainly, the certificate itself doesn’t work magic. There’s a lot more to it. But the idea is worth considering. How does one verify this certification? In other words, where do I go to confirm whether a perticular person is certified? I’m emailing you directly, Maurice. I would also like to know how the certificate is verified. The resulting credential is housed on a site called https://info.credly.com and can be linked to your Linkedin account for existing or potential hiring managers to confirm. 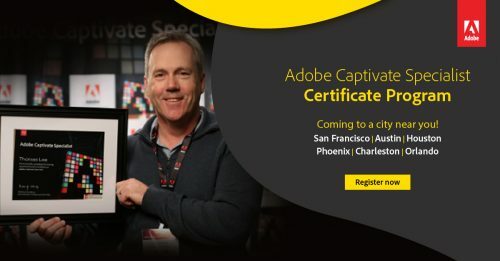 What is being done to create an online Adobe Captivate Certificate? 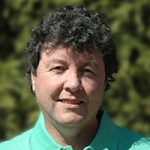 What can I do, or others do to voice a need for an online certification? It is a request well heard and we are working on it, but we have no further details at this point on the same. Should be doing an online event, many sites are outside the learning events Adobe e-Learning. Concur— I posted questioning whether an online option was available. What will it take to create an online Adobe Captivate Certification? What can I do? Will there be an online session so people who are not in America can also be certified? I wish I would have come across this sooner! When will the next Adobe Captivate Specialist Certification program be available? Watch for updates from Adobe, they said they were making it available online. I’m sitting in this training right now, and I could TEACH this training. This is very basic. My company is paying for it, I get a couple days out of the office, and they will be impressed when I return with a “Specialist” certificate. I’m working on practicing some other techniques right now. The instructor is OK, but this is basically Captivate 101 – if that – maybe Captivate 10 or so. This is a 1-day training starting with a tour of the interface. I think the result you got was the result most of us expected. I love Adobe Captivate but that would be one hell of an Advanced Action! Totally agree, some even after 5 years of creating boring eLearning based on simple PPT’s are still all but specialists. What’s in a name? Is there plans to have a Specialist Certification for those that are expert level Captivate users? Similar to the certifications you offer for Photoshop, etc? That would be useful and something I would be interested in. I do think calling someone attending a 1-day training (regardless of how much pre-work there is) a Specialist. That will water down the title for those of us that actually are Specialists. FYI – I handle the Captivate training/technical support for the ID team at American Express and I can tell you that after receiving my training and a year of regular Captivate use, there are few I would call a Specialist. Are there sample quizzes or test to run through before doing the final certification test that give you one shot at it,If you fail you have to pay again and do it all over, which i do not agree with. I’ve finished the course and found after ever module there were no quizzes, just one video after another. What other dates and locations are being offered? Maybe you are misunderstanding, I posted that comment as a consultant/trainer. I do coach basic training like the one I mentioned, in classroom and online. I am brand new (I mean before beginner new) in Captivate. Where do I go to learn from the beginning? What are the basic 4-day classes that you have mentioned? You take classes with Adobe Authorized Training Partners who are certified by Adobe as Adobe Certified Instructors to teach their software. You can find these professional trainers on the Adobe Web Site. Ok, so if I, and others, (like Lieve) can already do all these things in CP 2017, and more, and build courses on a daily basis with Captivate, can I have my certificate please? I know how to do all tasks in the topics of your course. Why should I pay $500 for a pdf file? I agree with Suantura. I would be 100% interested if the ACE Exam were available for Captivate 2017 (or 9, even). Will the certification test be available to those that are already comfortable with this level of Captivate? As I understand it the last certification exam available is ACE for Captivate 8.
any training sessions conducted in the Philippines? I would be happy to travel to Philippines to teach Captivate…..
Is English OK for the training? Not planned as of now, but stay tuned! We may plan something soon. Sure, Alexandre, what is mentioned in this programme is what I include in a basic training of 4 days, but including of course the Timeline to start with. I do not really see why this would lead to a ‘specialist’. Building themes (not templates, too much issues at this moment) is my third priority, after Quizzes. I do coach intermediate and advanced courses, but never in a classroom setting, always personalized. I find that the most efficient way to upgrade skill levels for Captivate. As an instructor/educator/developer, I have to agree with Lieve. Covering this amount of content in any substantive detail in a single day? – compared to 4 days training — at best call it demonstrated capability at an ” Associate or User” level. I am also in agreement with Alexandre – topics like suggested would make it worthwhile to use a day of my time to seek a “Specialist” designation. I feel that knowing just those topics would hardly make you a ‘Specialist’ in CP 2017 (10). Hi Lieve & others, the course is designed in a way where all registrants will get access to the course material well in advance of the classroom session, and will be given clear instructions on what to prepare before they come to the classroom session. The expectation (like most advanced classroom pedagogy styles) is that learners come prepared to class, so they can make the best use of classroom time with the instructor to dive deep into the concepts. Gourav, I used flipped classes in college before the word appeared publicly. It was the main reason I have searched for an application that allowed me to offer assets to the students to use before coming to the classroom, and work out projects and assessments in the classroom. I was very lucky to discover Captivate, version 1 at that moment and I used if for those self-study and self-assessment assets for a lot of applications I had to coach: Photoshop, MS Project, MS Excel, AutoCad etc… Is there a ‘pretest’ for this certificate and a fial assessment? Of course we know your expertise in the area of education! For the Adobe Captivate Specialist certificate, there is pre-coursework involved and a final assessment. I did see after posting the comment that there is a final assessment. Have some more ideas for the future, if you want to talk about it. Lieve: if at some point I get an employer ready to spend the amount of money required for an employee’s personalized development plan, I will most probably want to take one of your personalized courses. I am very slowly building a portfolio to showcase my skills and to provide freely as to help others develop advanced materials, and in the unlikely event that my current employer would pay for this, I’d hit you up with a request soon using that portfolio for you to identify my strengths and weaknesses. I don’t have high hopes, though. I will echo Lieve’s statement about Timeline and Shared Actions. On the other hand, this sounds like an intro course, the kind I would give to my staff who never worked with e-learning to be able to build basic e-learning modules. It’s useful and necessary for sure, and I definitely encourage this, but are intermediary and advanced level courses/certifications planned eventually for those of us who want to learn the much more advanced interactions? Maybe I’m a bit greedy, but I would really benefit from such a course. If you want advanced instruction on CP, message Lieve Weymeis, theres not a lot about Captivate that she doesn’t know, specially the advanced parts. She is a trainer and teaches courses in Captivate. I would recommend her as an instructor. I hadn’t been here awhile, so sorry about the delay for the response. I have posted my fair share of questions on the forums, and indeed Lieve has been a tremendous help through it all. Where is the Timeline as subject? It is clear from the questions on the forums that lack of understanding the Timeline is the first cause of frustrations and problems for Captivate users. You don’t mention shared actions, but I understand that you cannot squeeze eerything in one day. Shared actions are IMO lot more flexible and powerful than advanced actions in many situations. Hi Lieve, The timeline is an extremely important topic and it shall be covered in the section “Touring the Adobe Captivate interface”.